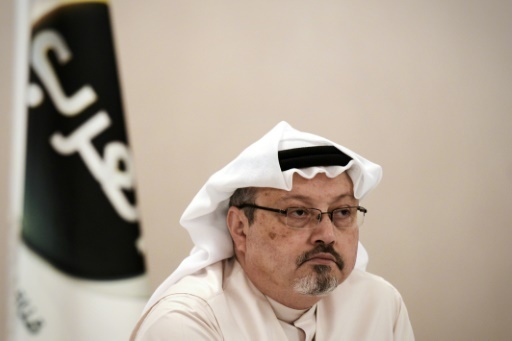 Istanbul (AFP) – Turkey on Saturday accused Saudi Arabia of failing to cooperate with a probe into the disappearance of a journalist inside its Istanbul consulate, as US President Donald Trump threatened Riyadh with “severe punishment” if it turns out he was killed. 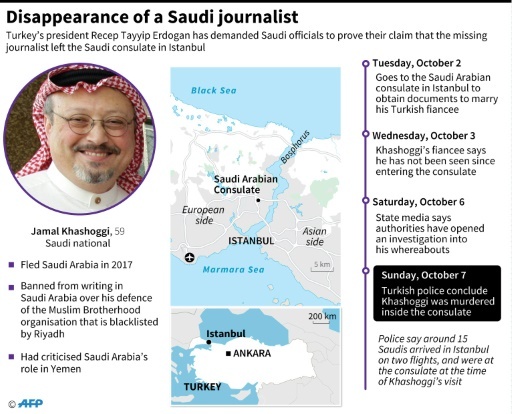 Comments by Turkish Foreign Minister Mevlut Cavusoglu represented a hardening of Ankara’s hitherto circumspect tone over the the case of Saudi journalist Jamal Khashoggi, who has not been seen since since he stepped inside the consulate on October 2. AFP / Yasin AKGUL. 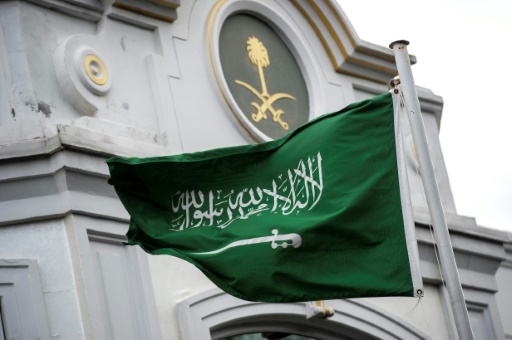 The missing Saudi journalist disappeared after entering the Saudi consulate in Istanbul. “We’re going to get to the bottom of it and there will be severe punishment,” Trump told CBS’s “60 Minutes”, according to an extract of an interview that was released on Saturday. “Where did he go missing? There, at the consulate,” the Turkish foreign minister said, adding that “talks are continuing” with Saudi officials in a bid to resolve the impasse. Interior Minister Prince Abdel Aziz bin Saud bin Nayef slammed claims that the kingdom ordered Khashoggi to be killed inside the consulate as “baseless allegations and lies”. AFP / Thomas SAINT-CRICQ. Disappearance of a Saudi journalist. Meanwhile Prince Mohammed’s big October conference — the Future Investment Initiative dubbed by media as the “Davos in the Desert” after the annual conference in the Swiss resort — has suffered a litany of cancellations over the controversy. Key business figures like the chief executive of ride hailing app Uber — into which the Saudi’s own investment fund injected money — are no longer showing up while media groups like the New York Times, Financial Times and Bloomberg have pulled their sponsorship. US Treasury Secretary Steven Mnuchin said Saturday that he still planned to attend, as did IMF chief Christine Lagarde although she said she was “horrified” by the case. Featured Photo: AFP/File / MOHAMMED AL-SHAIKH. Saudi Arabia has hit out at accusations Jamal Khashoggi was murdered inside its Istanbul consulate. Stuart Williams , the Istanbul Correspondent for Agence France-Presse (AFP), has appeared in Business Insider, Albany Times Union, Military.com, Yahoo, MSN, The Times South Africa, Sydney Morning Herald, France 24, La Presse, and Japan Today Istanbul, deputy bureau chief for Agence France-Presse (AFP) in Turkey. Previously Frankfurt, Paris, Nicosia, Tehran and Moscow.